Our congregation is excited to announce the commissioning of Jeff Schmatt as a new Stephen Minister and Marci Schmatt as a new Stephen Leader on 5/21/17. Pictured above: Jeff & Marci Schmatt in center with Kim Ott on left, and Cathi Stoner on right. 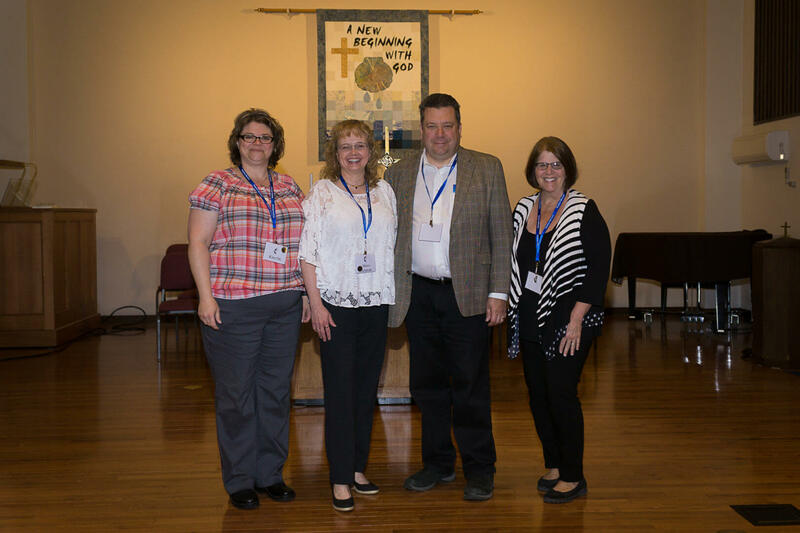 Jeff completed 50 hours of specialized training in Christian caregiving and joins a team of 8 Stephen Ministers at United Methodist Church of Mount Vernon serving our congregation and community. Stephen Ministers provide confidential, one-to-one Christian care to people experiencing a crisis or going through a difficult time. Stephen Ministers meet weekly with their care receiver for around an hour to listen, care, encourage, pray, and provide emotional and spiritual support for the person. Caring relationships last for as long as the person’s need persists. Marci recently completed one week of additional Stephen Series Leader’s Training Courses in St. Louis. Stephen Leaders are pastors, church staff, and lay leaders who work together as a team to lead Stephen Ministry. They come from all ages and backgrounds, but they all share a common passion—bringing Christ’s love and care to hurting people. Marci is now fully equipped to assist with directing Stephen Ministry in our congregation. Please lift up our new Stephen Minister and new Stephen Leader in your prayers, asking that God bless their ministry and work through them to bring hope and healing to those they will serve. Pray also for our other Stephen Ministers and their care receivers. Our congregation is one of more than 11,000 worldwide, representing 160 Christian denominations, that use the Stephen Series system of lay caring ministry developed by Stephen Ministries in St. Louis. To learn how you may become a Stephen Minister or to receive care from a Stephen Minister, please contact the church office at 319-895-6286 or Stephen Leader, Cathy Stoner, at 319-551-6666.